A focus on increased volumes of data in SCADA systems without a corresponding focus on proper configuration of associated alarms leads to poorly designed alarm systems, which in turn overwhelm the operator with alarm floods. Large numbers of alarms with little or no contextual increase the risks of missed alarms and potential plant damage or personal injury. Alarm management is one of the most important yet most undervalued and overlooked aspects of industrial operations. Studies show that more than $20B is lost annually due to unscheduled downtime, and 40% of these losses are linked to preventable human errors. It has been observed in various research studies that human performance contributes to 70-80% of all abnormal situations at industrial plants. I am happy to share the new Alarm Management infographics that our team at Wonderware (Schneider Electric Software) created. This infographics has some interesting information about common alarm management challenges, signs of poor alarm management system, and top alarm management priorities for control room operators, engineers and facility managers. Click here to download the Infographic: Effective Alarm Management. Effective alarm management is the key to a plant’s safety, productivity and profitability. And to achieve operational excellence, it is very important to understand and use Situational Awareness concepts in combination with alarm analysis software such as Wonderware Alarm Adviser and HMI/SCADA software solutions like Wonderware InTouch and System Platform. The ANSI/ISA-18.2-2009 Standard defines ‘Alarm Flood’ as a condition during which the alarm rate is greater than the operator can effectively manage, e.g. 10 or more predictive alarms in any 10 minute period per operator. Alarm floods have been identified as one of the major contributing factors in a number of industrial incidents. The EEMUA guidelines suggest that there should be no more than 30 shelved alarms in an efficient industrial facility at any given time. EEMUA recommends no more than 10 standing alarms for facilities during steady state operations. Read the post to learn about the top nine indicators of poorly designed alarm system and ineffective alarm management, and identify the ones that are present in your facility. Situational Awareness cannot be successful without a proper alarm management strategy. Without an efficient alarm management system, it is basically like tying a horse behind a cart and it really has no purpose. The management of alarms, design, runtime, and analysis can be an enormous task. This process is also ongoing; not a task that is executed only one time. Though this ongoing process can appear tedious, ultimately it will result in more stable operations with higher throughput. What’s more, operators can be freed to focus on other more productive activities. At Schneider Electric, our approach to alarm management begins with a thorough analysis of the current situation, implementation of the system, and alarm system philosophy. These activities are ongoing activities; monthly/weekly activities are required to act upon report data, and to execute improvement plans such as eliminating bad actors, implementing state-based alarm suppression, and/or adjusting alarm limit settings. Here is a graphical representation of high-level annual and monthly operations activity plans. 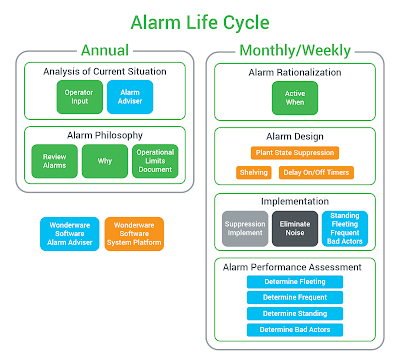 This is a modified version of a typical alarm management life cycle, which shows where exactly Wonderware software fits in. Are nuisance alarms affecting your operators’ effectiveness? Learn how to manage your alarms better! 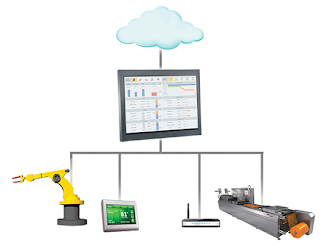 For more information on our HMI/SCADA portfolio, contact a distributor.